 2018 Newest Update Version：Super Fast Wax warmer + Auto-shut-off Function: maintains ideal wax consistency - a wide range of accurate temperatures (160℉ to 240℉) and adjustable thermostat control knob for a quick wax meltdown(in 8 minutes).Upgraded heat-resistant ABS material to prevent overheat; Large-capacity 500ml waxing pot.  High-Quality Hard Wax - 3 different flavors(lavender, cream, rose). Our hard wax comprises natural, gentle and safe ingredients. Made from high-quality resins, aromatherapy oils, and natural items. Safe enough to use on face, hands, legs, toes, eyebrow, full body like underarms, bikini lines and many more areas of the body, and around 85% to 99% success rate without any side effects. 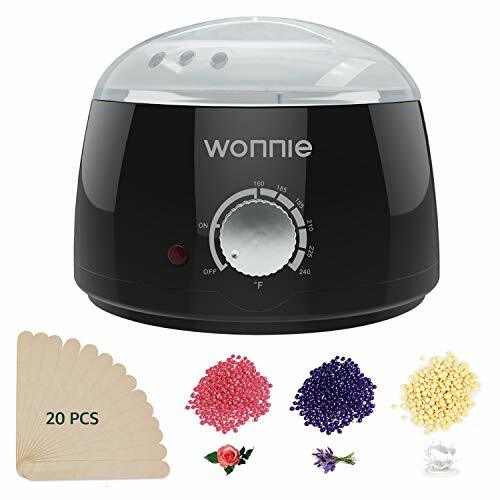  Thorough hair removal + Smoother Skin + Long-lasting + Finer Body Hair: This wax heater can melt most types of depilatory wax such as wax beans, hard wax, paraffin wax, pearl wax, soft wax and more. Hair removal of WONNIE wax heater is cleaner and more thorough, use is safer, skin is smoother, and hairless is longer.  Easy to Use and Clean - can be used for different types of wax, like hard wax, soft wax, loose wax, bricks bikini wax kits, microwavable wax kits and hair waxing kits. Enjoy a fast and efficient hair removal with our professional waxing kit at-home or in traveling. The wax warmer with a removable pot makes it easy to clean. Just take it out.  Quality Assurance: This wax warmer use nonflammable, hard, great surface performance material and 2018 latest temperature control system. We provide 30 days no-worry refund; 2 years Warranty; 24/7 for any questions and concerns customer service, WONNIE always put every customer\'s safety and user experience first. Buy in confidence!